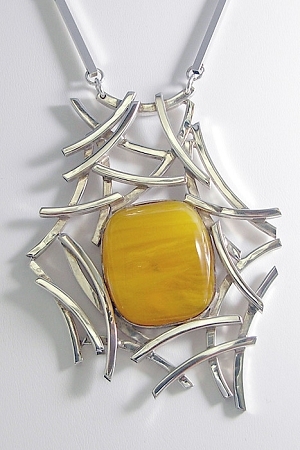 Curves Jewelry - This is a unique bold and beautiful Sterling Silver statement pendant that features a large chunky freeform yellow Copal Amber cabochon (34mm x 29mm). This gorgeous dramatic necklace comes with a 24" sterling silver adjustable chain. From our "Silver Curves" Collection, this is a handcrafted sterling silver pendant created from random curved segments of square tubes soldered in a random "web" pattern. This statement pendant frames a large chunky freeform Copal Amber cabochon. Copal Amber, fossilized tree resin, is from Tanzania and is a younger Amber than the Baltic Amber. The pendant comes with a 24" sterling silver adjustable chain. This One-of-a-Kind pendant measures 3.46" long x 2.7" wide. 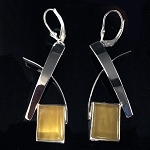 The Copal Amber is approximately 1.3" long x 1.1" wide (34 mm x 29 mm). Includes an 24" sterling silver square link adjustable chain.